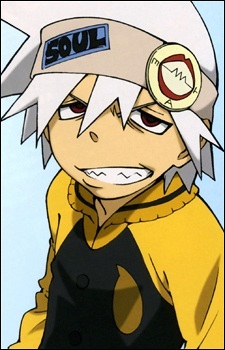 Soul Eater, "Soul" to his friends, is Maka's Demon Scythe partner. His human appearance is that of a teenage boy with a forever present drool mark coming from his mouth. He acts like a normal teenager and his personality mostly consist of what he considers "cool". Being a "cool" guy, he almost always uses the direct approach which most of the time fails. He sometimes becomes too driven by the idea of eating souls, which leads him to bicker with Maka, but in the end they remain friends and partners. His way of absorbing souls is by literally eating them. He says that it's the texture, not the taste, that matters. When Dr. Stein saw his soul, he said it was that of "a twisted person with a sarcastic soul." Yes, his last name is actually Evans and he is really cool.